Our EDC solutions simplify data collection, aggregation and analytics. The intuitive and easy to use interface and query management features drive efficiency through the clinical data management process. Our solutions are fully compliant with all FDA regulations including 21 CFR Part 11, and ease the process with fully compliant CDISC SDTM exports right up to submission. The data summary and reconciliation reports were developed in a Cooperative Research and Development Agreement with the FDA. Our solutions use state of the art technology and provide the leading functionality in electronic data management with the ability to accurately capture, manage, and report patient data. Our EDC solutions are scalable to support multiple studies from Phase-I through global Phase-IV, and are configurable to handle the simplest to the most complex study requirements. As your organization grows our solutions can grow with you to meet your trial supply, medical coding, safety reporting, and mobile health requirements. Our EDC solutions have ﬂexible architecture and integration capabilities to accommodate your workflow requirements and facilitate easy implementation. You can make changes at any time during the study, configure source document verification (SDV) requirements, and manage multiple case report form (CRF) editions. The deployment as a hosted solution reduces hardware cost, validation efforts and organizational impact. Our EDC solutions streamline data management and offer value added reporting and document sharing capabilities. Efficient data management reduces data processing and study administration time. Study sites can be given access to their data in real time, and run reports at any time. With a full suite of reporting and transfer features, our solutions provide you with everything you need to run a clinical research study from setup to submission. 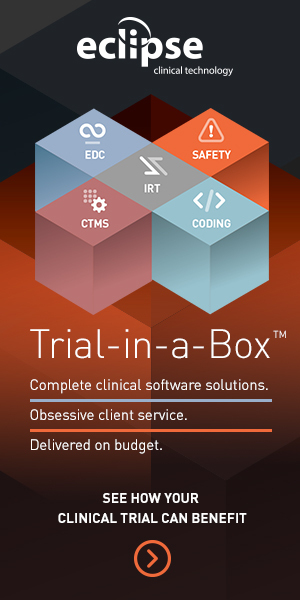 Our EDC solutions are among the leading clinical trial software that integrates with our certified coding application. Conduct pharmacovigilance coding and safety coding with eclipse coding. Eclipse Coding workflow streamlines the coding process and improves clinical trial coding efficiencies. Manage and code with multiple dictionaries, versions and formats. Code all clinical trials one at a time.